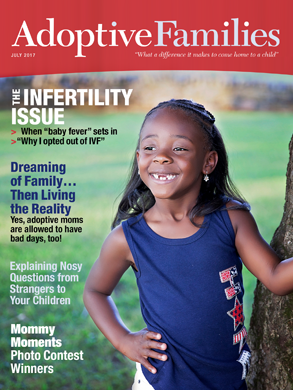 Readers share feedback about articles published in the July 2017 issue of Adoptive Families magazine. Oh, my gosh. I could’ve written this essay. Yes. Yes. Yes. Everything the author said. When I’ve voiced bad days, I’ve also heard “Well, this is what you wanted….” Thirteen years infertility…more than three years adopting. Yes, it is what I asked for, but parenting can also be hard. We love our kids, but, holy moly, they can drive us up the wall as much as anyone else’s! I too feel that people don’t want to hear my struggles as a mom because I “knew what I was signing up for” or judge me as sounding “ungrateful” for the chance to be a mom. My own husband has even said, “Well, you wanted kids so bad and this is what we get.” When, really, the struggles I have are just those of any mom—when the kids don’t listen, or get in trouble at school, etc. It can be rather isolating at times. I didn’t really get this from others, but more from myself. It always made me feel guilty until I heard that all moms have these thoughts sometimes. That helped validate the feeling that I was a real mom. We are moms! We can get depressed after placement. We can wonder if we made the right decision. We can take our time to fall in love with our child. We can complain. We can be stressed and exhausted. We can also weep at a love we never knew was possible. We can adore our children and they can drive us nuts. We are simply MOMS! I also pursued adoption before trying IVF, and am so glad. The goal was to parent forever, not be pregnant temporarily. This story felt so familiar. After years of enduring the indignity of infertility treatment, adoption was wonderful. Easy, no. But we wouldn’t change a thing about how or when it happened! I had friends who read me the riot act for not considering IVF, but it wasn’t really a choice I wanted to consider. I wanted a family, not more fertility angst, and adoption gave me that. I love my two beautiful children and can’t imagine my family any other way. I would have opted out of IVF sooner, but I wasn’t educated enough about the process and truly believed it was nearly impossible to be graced with a child this way. As it turned out, it was totally the opposite. There’s just not enough education out there. We had to share news of a birth parent’s death with our boys. It was their biological father, whom they had only met a few times. We were straightforward and honest with them and asked if they had any questions. We also used it as a chance to once again discuss the dangers of any drug or alcohol usage. I wonder who “advised” this family that they try to keep adoption secret or even fake a pregnancy on social media… maybe they watch too many TV soap operas? I’ve never heard of anything this ridiculous and am disturbed that anyone would ask about it. We did not keep our adoption plans secret or pretend to be pregnant, however I can see why you would want to. When you announce an adoption you get so many questions and hear all the horror stories. Rarely is there a “congratulations”; instead you are greeted with concern. I shared my entire adoption journey with my friends and family on social media. I did it for transparency purposes and to educate people on adoption. So many people had misconceptions about adoption and thanked me for being so honest about the journey. I wouldn’t change a thing about my level of transparency.